Nothing gets me in the 'Fall Mood' like some yummy, comfort food. 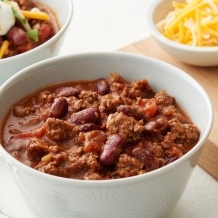 One of our family's favorite Fall recipes is chili! There are so many different kinds, you can never go wrong.. especially if it's a toss it in a crockpot and go type recipe. Here are five of our favorite Fall chilis that you have to try! 1. Every cookbook needs a classic chili recipe, this crock pot version from Cooking Classy is always a huge hit. 2. A personal fave is this Creamy Crockpot White Chicken Chili from the Chunky Chef. A fun twist on chili with some Mexican flare, top it with cheese, sour cream, lime juice, and tortilla strips! 3. Speaking of Mexican, we love this Creamy Taco Chicken Chili from Chelsea's Messy Apron. Spicy, yet creamy and warm- everything we could ask for from a Mexican Chili! 4. A fun and unexpected twist on Chili Night is to whip up these Waffle Iron Cornbread Waffles as the base of your favorite chili recipe! The kids will love how unique it is and so will your belly. So delicious. Or top your chili with cornbread like this Cornbread Topped Skillet Chili. 5. Chili on the go? Yes, Please! Next campout or backyard BBQ try this Frito Pie in a Bag. Whip up your favorite chili recipe, get out all the fixins' and let your family fill individual Frito bags with chili and their favorite toppings! Since dinner can be served a la crockpot, you have more time after work and school for activities!